Operating theater nurse Mateja Stare spent one month in Gaza working at the MSF field hospital in Khan Younis. An MSF staff member tends to a young burn victim. My name is Mateja Stare. I'm 38 and I am from Slovenia. In Ljubljana, the capital, I work in the country's largest hospital. I am an operating room nurse. I've just come back from the Gaza Strip, where I spent a month on mission with Doctors Without Borders/Médecins Sans Frontières (MSF). Before joining MSF, I worked in the Ljubljana hospital for 16 years. I started as a flying operating room nurse and, after seven years in different surgical units, I became the head operating room nurse for reconstructive surgery and burns. I held that position for five years. Then I spent two years as the operating room manager, which was new for me and full of challenges. Last, I trained new operating room nurses. To say that you want "to help people in need" can sound a little superficial, and even frivolous, but it's also true. I really believe that after you've organized your life and everything is going well, the time comes when you need to share your expertise and your experience with other people—with people who haven't had the same luck. So why not join up with a humanitarian organization? I was recruited by MSF's Austrian office last October. I received training and then I settled in to wait for my first mission. 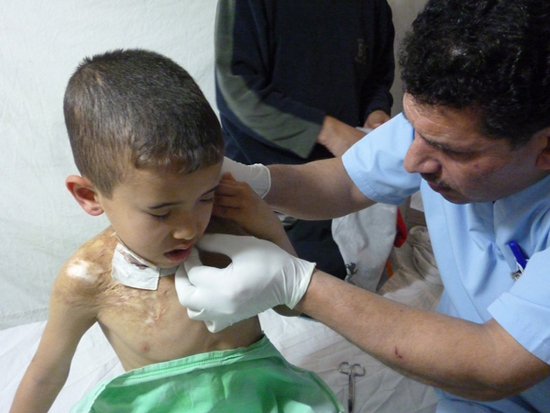 At the end of January, MSF asked if I wanted to go to Gaza and work with their reconstructive surgery program. It's not an emergency project, it's more medium- to long-term and it relies on the availability of surgeons that MSF can recruit and send out to the field there. My family had some concerns at the beginning because that part of the world has a "bad reputation," but I had no doubts. In the end, when they saw how enthusiastic I was, they supported me. I arrived in Gaza two days before a spike in violence between the Israelis and the Palestinians. The fighting lasted five days. When the fighting began, our project coordinator received tons of text messages with all kinds of warnings. That didn't reassure me! I tried to remain as calm as possible—it wouldn't have helped to panic. During those five days, I felt safe and well-informed. Perhaps coming from the former Yugoslavia helped me. Twenty years ago, we fought a war of independence too, and everyone knows how horrible that was. I worked as the operating room supervising nurse in Gaza. I managed, directed, trained, evaluated, coordinated, organized, and planned everything in coordination with the surgical activities. We worked in an MSF field hospital, in tents set up in front of Nasser Hospital in Khan Yunis, a city 20 kilometers south of Gaza City, where MSF has its office and house. Because of the events, we were only able to operate during for four days of that month-long mission, but we decided to do the maximum number of operations per day. There are posters hanging all across the Gaza Strip with information about this program inviting potential patients to consult our teams. The day before the surgeries began, the surgeons—both Palestinian and expatriate—carefully examined 200 patients. In the end, we operated on 25 people and dressed the wounds of two additional sedated patients. Surgery began at 7:30 a.m. and ended around 6:00 p.m. We managed to do seven or eight operations every day. Seventy percent of our patients were under 5 years of age. The youngest was seven months and the oldest was 60 years. Most were suffering from skin contractures as a result of burns. Others had congenital malformations, such as syndactylism (the webbing or fusion of two or more fingers or toes). Some had already had an initial operation during the prior MSF surgical mission. We also performed emergency surgery on two burn patients. There are lots of explosions of domestic gas containers in Gaza. The electricity is cut off every day so people use damaged or poor-quality gas canisters to heat their homes or cook. Unfortunately, children are burned every day in Gaza. Before I started working, I visited Nasser Hospital. I met Palestinian plastic surgeons and the head of the burn unit, too. The head nurse gave me a tour of the department. They have only five beds and 50 square meters. They use curtains for walls. There was a little 10-year-old boy in one of the rooms. His mother and grandmother were with him. He had been injured two days earlier when a gas container exploded. He had third-degree burns on both hands and on his face. He lay there, with his eyes open, in his bed. Over the next few days, I thought about him a lot and about the kind of treatment he would—or would not—receive. Two weeks later, we started operating in the tent and the Palestinian surgeon asked if we would perform emergency surgery on a young burn patient. I thought of that little boy immediately and I was right. I saw him when he arrived the next morning, completely exhausted, thin and pale. I was so sad because he clearly had been suffering for more than two weeks. After administering anesthesia, we bathed him so that we could better assess the extent of his injuries. He needed surgery on his hands and face. I saw him five days later, when we changed his dressings under sedation. He still looked like a ghost and couldn't bear to be touched as it was too painful. He'll need many more visits to change his dressings and for physical therapy, but I think he was lucky to have had an MSF doctor operate on him because now he'll receive the high-quality care he needs.